In a time before Happy Madison officially became the production company it was widely acceptable to hate – well, more than it already was – Paul Blart: Mall Cop became an unexpected box office hit for star Kevin James and launched him into the realms of the company’s “top” (a word we use lightly) players including Adam Sandler and David Spade. Those reasons alone are the only justification there is as to why they made a sequel… six years later. Honestly, who even remembers the first film by this point? In the midst of everything Happy Madison has done in between both films, including notorious failures Jack and Jill, That’s My Boy the two Grown Ups films and countless others, Paul Blart doesn’t even register with audiences anymore. It’s common for studios to make sequels to financial hits, even for films that no-one really liked to begin with, but when you wait half a decade to make it and at a time when the company has truly become the laughingstock of Tinseltown the results are almost never going to work in your favour. Such is the way with Paul Blart: Mall Cop 2, which offers pretty much exactly what the first film offered but on a far less appealing scale. The film is worse than being virtually laugh-free, it’s also very boring. 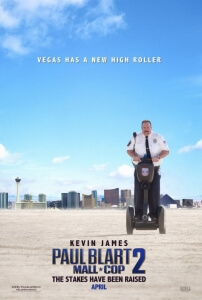 The main joke, as was the case with the first one, seems to be the fact that James’ Paul Blart is overweight and not very bright; there are dozens of scenes dedicated to conveying that one joke, none of them working because they are all just different variations of the same punchline. Whether he’s falling over, pushed over, passing out due to low blood sugars, tripping up over things, or even being defeated by various animals, there is no question that the film desperately wants you to laugh at James’ misfortune merely because of the size of his waist. But when you’re subject to the same thing over and over again, it gets tiresome very quickly and all interest is lost. This wouldn’t be such a problem if Blart himself was a sympathetic character to follow; unfortunately, even that is compromised because there are multiple instances where he acts like a massive prick (no pun intended) when it simply isn’t called for. For instance, a sub-plot sees Blart’s daughter Maya (Rani Rodriguez) being accepted into UCLA, but Blart initially refuses to let her go for the simple reason that he will be lonely (in the film’s prologue, former love interest Jayma Mays and Blart’s mother played by Shirley Knight are monstrously written out in ways that are both insulting and degrading, especially for Academy Award-nominee Knight). There’s being overprotective, and then there’s being uncomfortably intrusive and selfish which he is undeniably being by preventing his only daughter from having a future; it’s very hard to root for him after these scenes, even in later attempted scenes at drama. Although the film is set in Las Vegas, where there could potentially be more opportunities for set pieces, it is instead wholly confined in and around the Wynn Hotel, which itself doesn’t necessarily allow for great potential. The whole film is basically a 94-minute advertisement for the hotel itself, with owner Steve Wynn even getting a cameo at the very end; to be fair, it does look like a nice hotel but when you’re forced to look at it for an hour and a half the wonder of it all soon evaporates and it’s just another neatly-decorated building in the middle of the desert. Throw in some of the usual Happy Madison traits, including an uncomfortable portrayal of women both elderly (aside from Knight’s less-than-graceful exit early on, a cleaning lady accidentally getting punched and then dismisses it by saying she “deserved it”) and attractive (Daniella Alonso’s hotel manager is randomly and madly attracted to Blart, because reasons), and juvenile gross-out gags including the world’s most disgusting banana, and you have exactly what Paul Blart: Mall Cop 2 was meant to be; a symbolic gesture of something that’s way past its expiration date. 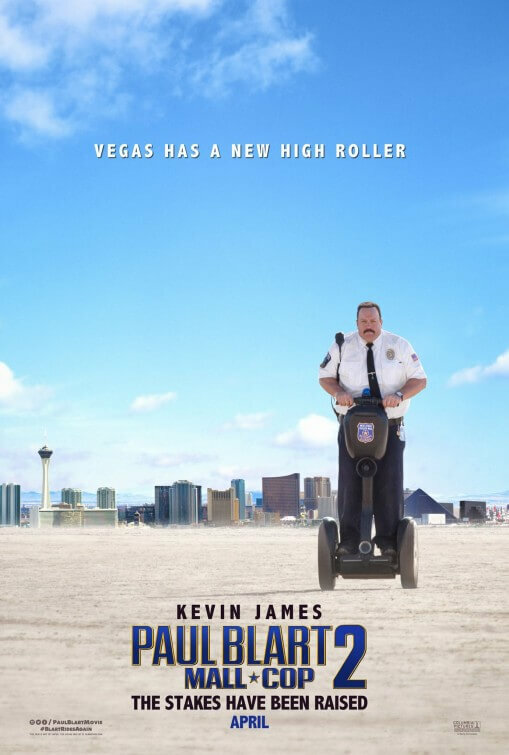 Paul Blart: Mall Cop 2 is a laugh-free, dull comedy sequel that doesn’t benefit from an unlikable main character, its blatant advertising of the Wynn Las Vegas Hotel and the usual lowbrow Happy Madison traits.